Ouch. Yeah, did I mention that soldering a 3D grid of LEDs is difficult? To start, id make sure that the holes for the LEDs are big enough to easily slide the LEDs in and out, once they are soldered into a grid, it will be difficult to remove the grid w/out buggering up your LEDs. There are many ways to prep the leads, and lay the wires, Its unclear how exactly you are doing that, if you can provide pictures, that might help. The LEDs shouldnt be burning out, you may lose one or two, but a bunch is unusual. The thick wire requires a lot of heat, one way to prevent the heat from damaging the LED is to pre-tin the wire, then when you put it next to the LED, you just quickly reflow the solder with a little flux on the joint to keep things clean and happy. 3-5 seconds is a lot, but I've done worse. Good solder joints are typically take 1 to 2 seconds, but can vary depending on how much mass you need to heat. With the thick wire, hotter is better, I solder really fast, so I want the hottest iron I can find so that I get the heat in and out as fast as possible. I just recently wrote this up about soldering. If you poke around you can find other good info about preparing parts and wires and stuff. When prepping parts, the better job you do, the easier the soldering will be, Once you figure out how to prep your part well, the soldering will become easier, and you will also figure out how to prep your parts to make soldering easier. Basically, the more time you spend in prep, the less time you spend in soldering, so it pays for itself in time savings, and the better you do in the early steps, the better the end results will be, so its kind of a double win to spend the time prepping the parts. The reason some LEDs lit and others didnt may be due to solder bridges or broken solder joints (shorts or opens) its hard to say from here. Im building a cube that doesnt use craft wire, and I think its more difficult lapping 2 thin wires, than crossing wires in a solder joint. At least the lap solder joints are flat aluminum leads, which makes things a little easier. If you have a heat gun, you might be able to use it to heat up the blob of leds and salvage some of them, and start over. The first cube I built was made with leftover flashlight LEDs that I salvaged when modifying flashlights. It was more difficult, bu it worked. Thank you for your answer Well, you did mention that soldering a 3D grid is difficult and I was prepared for that, but what I'm experiencing is way beyond difficult. It's just impossible to work like this. The 4x4x4 cube contained only 64 LEDs and about 10 of them burned out. Dealing with burnt out LEDs in the middle of a 8x8x8 cube would be absolutely impossible, so it's not even worth trying to build it until I can find a way not to burn out the LEDs. 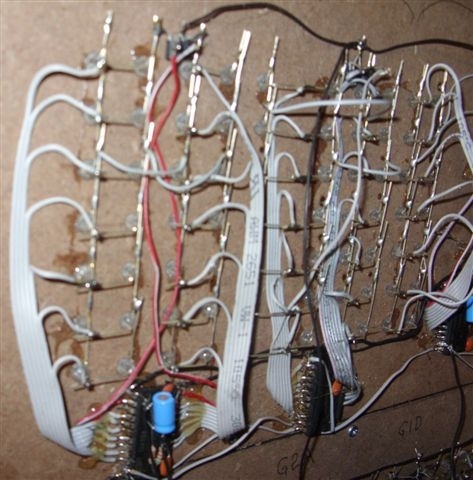 @Hippynerd: Nice article about soldering! It explains how you can burn out LEDs while soldering. I'll try it today. I'm curious how fast they fry. When I built my cube, I tested each layer before assembling the whole cube. I also found the same problem, the layers were good until additional soldering occurred. Out of 125 leds I had 3 fail but, my build method probably used less heat. Yepp, that's exactly what happened! The layers were all fine on their own, but when I tried to put them together, all hell broke lose. BTW, what soldering temperatures do you guys use? 250-300 Celsius degrees? Perhaps more? I've read in several places where people explain how to build an LED cube that they like to use "good hot irons" but only for a second or two. I find it impossible to be in and out in 1-2 seconds, so perhaps a less hot iron would make a difference without increasing the probability of cold solder joints. I have to find a way to do the soldering with very low probability of burning out the LEDs, otherwise the 8x8x8 cube will put me in the loony bin. Personally, I like the hottest iron i can find, im not very patient, and sometimes i burn things, but Im the person that will have to fix it, so its not an issue for me. I think around 350c is my starting range, when i use temp controlled irons, I usually set them between 750-850F, usually in the 850 range. You probably dont want to go that high, because you really have to move quickly to avoid burning things. You may have an ESD or EOS issue going on. I have had some strange grounding issues with my non-grounded soldering iron, It actually lit up LEDs(just a tiny bit) while I was soldering them. It maybe that you have something like that going on. All LEDs are not the same, so it maybe that the ones you got are particularly sensitive. I would do some testing on the LEDs and see if you can cause failures, and try to figure out what not to do, before you ruin all your LEDs! I tried to load up that page you linked, and it didnt load for me. Make a new grid, and this time pre-tin the wire, make sure the solder is adhearing nicely to the wire, but just leave a little film of solder on the wire, not a glob. then when you solder your grid together, just reflow the solder. Flux is important because you want the solder to flow quickly, so you can get the heat off as fast as possible (1-2 seconds). The flux also helps prevent "Ice sickles" so you dont accidentally short on anything. I have reflowed the solder many many times without destroying the part, so I know that they can take a lot of heat, but sometimes it may wreck them with only a few seconds of heat. How are you testing your LEDs, maybe that is causing extra stress? I dont know how your LEDs could light or not light when the should/shouldnt, but my only guess is a short/open situation. I think its possible for an LED to fuse, and create a short, but my guess is its usually an open. I reloaded the page, and now it loads, so i'll look it over. I started playing with the LEDs tonight, to see how much heat they can take. I took a new LED of the very same type (from the batch used for the cube), I set my iron to 370 Celsius degrees (same as I used with the cube), gave the LED current, so that it would be lit up while I heat it to see exactly after how many seconds it goes out and started heating it... and guess what?! after 35 seconds of constant heating near the head of the LED still no sign of burning out. OK, so I tried it on the other leg for another 35 seconds at 370 degrees. Nothing. No damage. I repeated this about 5 times, abusing the poor LED in a barbarian way, but it's still fine, lights perfectly, no damage. I tried it with one more LED, same result. Heat does not seem to burn them out. At least not in 35 seconds. And I only solder them for 3 to 5 seconds, so that cannot be the cause. I was puzzled... So what the hack was burning them out?! I went to the garbage can and dug out the 4x4x4 cube that I had tossed yesterday night and started de-soldering the LEDs in order to have more to experiment with. At some point I thought I saw one light up while I was melting the solder near it, but there was no current connected to it, so I thought I was hallucinating or something... but no... it happened again and again. This perfectly explains why more and more soldering of the cube burns out more and more LEDs. They are exposed to AC for longer and longer times and eventually they burn out. At first I thought that perhaps my wall outlet into which I had plugged the iron does not have proper grounding (the iron does have grounding), so I took it to another outlet in another room. The result is the same. If I touch the LED with it, it ligths (when I also ground the other leg with my finger). Now the real question is: what is the problem with the iron? And is it just unsafe for the LEDs or is it also unsafe for me to touch? How can I get around this problem? Should I take it back to the store saying that it's not working properly? Or is this something normal? Assuming that this should not happen normally and that it's not just a problem with my iron, but a problem with all the irons of the same type, what kind of soldering iron should I get instead? What detail should I pay attention to? Why don't you take a AC voltage reading between your iron tip and an independent path to your power ground when the iron is turned on and see if there is indeed some AC leakage voltage on it. Most soldering station irons have a positive direct ground connection to their body/tip as a protection against ESD damage, but yours sounds like it might have a defect or broken connection internally or something like that. Most LEDs have a maximum safe reverse voltage rating of only 5vdc or so, and it doesn't take much current to damage a led that way, just apply reverse voltage above it's safe rating. In other words take an AC voltage reading with a multimeter between the iron's tip and the grounding in the wall socket? The iron doesn't need to be turned on the light the LEDs when touching them. I just needs to be plugged in. I wonder if I can demand changing it in the store because of this... I mean, is this a defect or it's just a poor model? Turn the iron on for the test, but no LEDs required, just measure for AC voltage from tip to ground while powered up. Obviously you can't leave your meter lead on the hot iron for too long. Make the test first. I searched a little for this product description but can't find anywhere where it states it's a grounded iron tip or that it offers ESD protection which is the same thing. Using the soldering techniques described by some of the guys above ( pretinning the legs, and then just reflowing the solder whie holding the legs still until the solder goes a dull colour again ) I soldered over 8000 joints on my last project without losing one LED. For my sins, I had to get 2 prototypes out before the PCB manufacturers opened after their Xmas summer holiday break ( everything shuts in South Africa for a month ) so I built them " dead bug " style. During the days of boredome at the bench, I calculated that I had spent over 10 hours in total just holding the wires steady until the solder set ! Heres a pic of a couple of the 60 dead bug chips and LEDs - DONT TRY THIS AT HOME FOLKS ! Thank your for the replies, guys! I will do that test tonight, I'm curious what I will find. First of all, I measured the voltage between the tip of the soldering iron and the wall socket's grounding. I've set the multimeter to 750 V AC and tried it. The result: 90 V! Wow! I know that there's no error in my measurement because I tried measuring the mains voltage with the very same settings and I got 230 V, which is the standard value here in Eastern Europe. Next I took another old soldering iron, which does not have grounding. With that one I obtained 45 V.
You know that what I initially observed, yesterday, was that if I touch either leg of the LED with the tip of the iron and the other leg with my finger, the LED lit up (although it was dimmer than usual). So I thought to myself, let's try to ground the tip of the iron by connecting it with a wire to the wall socket's grounding. And this is when the real surprise came! The theory was that the current will not go through the LED, it will go through the wire directly to the wall grounding and the LED will not light up. Instead the LED lit up twice as bright! Remember that I was still touching the LED's other leg with my finger. Next I completely took out the soldering iron from the equation. I just held one LED leg with my fingers and I connected the other LED leg directly to the wall grounding through a wire. The LED still lights up, although not as strongly as through the soldering iron. So what is going on here? Am I producing electricity and it's flowing through the LED into the wall grounding? And for minutes and minutes, without an end? How can I be producing electricity constantly? OR is the electricity coming from the wall grounding and going into me? I tried holding the LED and connecting the other leg to some other mass, like the radiator, that way it does not light. But if I connect one leg to myself and the other leg to ANY wall grounding in the apartment, it lights. I'll try taking the LED into another home in a different part of town, let's see what happens. What a stupid game of circumstances that lead to the destruction of my 4x4x4 cube!